Computer troubleshooting is the use of effective techniques to diagnose and then fix computer problems. 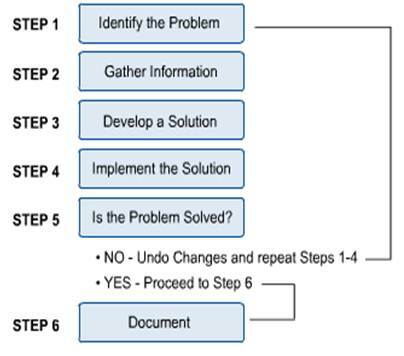 A series of logical steps speeds up the troubleshooting process. Rarely will simply guessing potential solutions for a problem work. 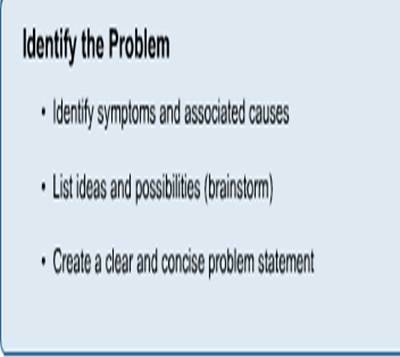 This step should provide a clear problem statement that defines the problem as a set of symptoms and associated causes. This is done by identifying the general symptoms and then determining the possible causes that could result in these symptoms. The outcome of this step should be a written set of ideas and possibilities. The information gathered here will be used to develop a solution to the problem. 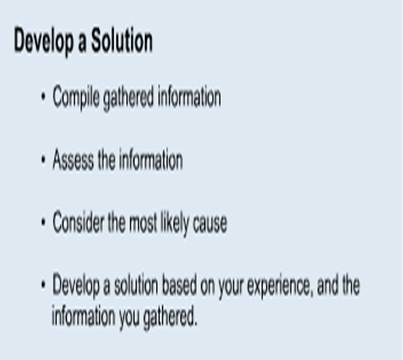 A technician will be able to make better decisions when the problem has been accurately described. The technician will assess the gathered data and its definition. The technician will use experience, logic, reasoning, and common sense to develop a solution. This step involves the technician working on the computer. The technician attempts their solution through hands-on manipulation of the computer components, which might be hardware and software. The technician is responsible for verifying that the system is operating correctly. 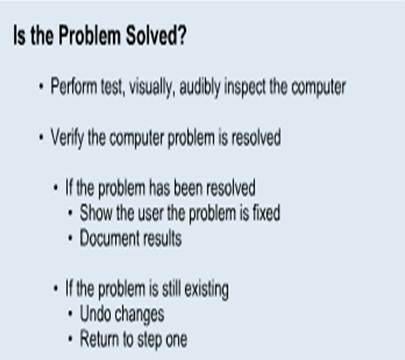 If the system is operating properly, then the troubleshooting cycle ends successfully. If the system is not running correctly, the troubleshooting cycle will continue. If the technician needs more information, go back to identifying the problem (step one). 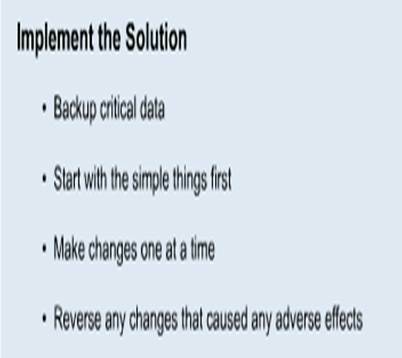 It is important to always document all the changes that were introduced to the system as a result of solving one problem. This record can be the starting point for troubleshooting any future problems. Every technician should have a good toolset. To correctly troubleshoot hardware problems, technicians will need to be equipped with the right tools. The average computer problem is not going to require sophisticated tools. There are many commercial software products available to assist in troubleshooting computer problems. ØSeveral types of diagnostic software are available for PCs. ØSome diagnostic functions are integrated into the PC hardware or into peripheral devices, such as expansion cards, whereas others take the form of operating system utilities or separate software products. 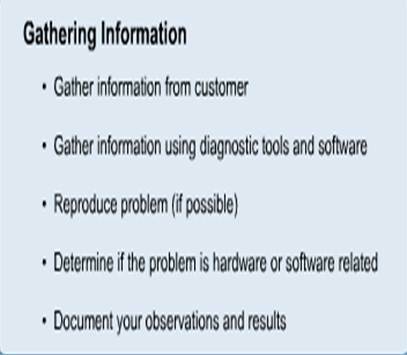 This software, some of which is included with the system when purchased, assists users in identifying many problems that can occur with a computer's components. In many cases, these programs can do most of the work in determining which PC component is defective or malfunctioning. POST. The power on self test operates whenever any PC is powered up (switched on). These routines are contained within the motherboard ROM as well as ROMs on expansion cards. Many of the larger manufacturers especially high-end, name-brand manufacturers such as IBM, Hewlett-Packard, Dell, and others make special diagnostics software expressly designed for their systems. This manufacturer-specific software normally consists of a suite of tests that thoroughly examines the system. In some cases, these utilities are included with the system, or you can download these diagnostics from the manufacturer's online services at no charge; otherwise, you might have to purchase them. Many hardware devices ship with specialized diagnostics software designed to test their particular functions. Adaptec SCSI host adapters, for example, include diagnostic functions in the card's ROM BIOS that you can access with a keystroke (Ctrl+A) at boot time. Sound cards normally include a diagnostic program on a disk along with the drivers, which test and verify all the card's functions. Network adapters usually include a diagnostic specific to that adapter on a disk, also normally with the drivers. Other devices or adapters also might provide a diagnostic program or disk, usually included with the drivers for the device. Operating systems, such as Windows 9x/Me and Windows NT/2000/XP, include a variety of diagnostic software utilities designed to identify and monitor the performance of various components in the computer. A number of manufacturers make general-purpose diagnostics software for PCs. This type of software is often bundled with other system maintenance and repair utilities to form a general PC software toolkit. Proper disposal practices should be undertaken when disposing of hazards materials. Technicians should be informed of the local regulations for the disposal of computer components. Chemicals, batteries, CRTs, and printer cartridges all need to be disposed of properly. Every time the computer is turned on, it runs through a Power-On Self-Test (POST). The POST is a series of self-diagnostic tests that the computer runs through to test the major hardware. The POST performs basic test routines on the motherboard and major hardware devices. It does not perform in-depth testing on the computer system. It can only detect major failures that will prohibit the boot up process. POST card is a device that helps troubleshoot computer problems that occur before the BIOS can report an error. There will be times when a computer fails before a BIOS error can be reported. A POST card is useful because it provides the technician with a digital readout of any POST errors. The complementary metal oxide semiconductor (CMOS) or non-volatile random access memory (NVRAM) stores the systems startup configurations and parameters. To access the CMOS setup utility, press the setup key during the boot process. The setup key must be pressed early in the boot process, or the system will load the installed OS. The CMOS setup key is usually F1, F2, or Delete. Clearing the CMOS memory is useful when the computer will not boot at all. The easiest way is to clear memory is to remove the CMOS battery. Turn off the power on the computer. Remove the CMOS battery from the motherboard. Replace the CMOS battery in its original position on the motherboard. Turn the power on (reboot) the system. A BIOS upgrade can include patches, fixes, additional features, and additional support for the latest devices that should resolve any problems. Special consideration must be taken before upgrading the BIOS. The motherboard is required to have flash BIOS and it must support the upgraded version. The BIOS chip also needs to support the upgrade version number. Only when these criteria are met can the BIOS be successfully updated. The motherboard coordinates the proper functioning of the system components. Troubleshooting a “dead” computer system is a process of elimination. Symptoms of a processor error can include slow performance, POST beep errors, or a system that is not operating properly. These errors usually indicate an internal error has occurred. Most CPU will have an on board fan. This provides cooling directly to the CPU. CPUs must be set to receive the correct voltages to run properly. Motherboards that use Socket 5, Socket 7 or Super Socket 7 chips need to use voltage regulators. Typically, the voltage regulators are built into the board. They must be set at the proper voltage, or the CPU can be damaged. SDRAM replaced DRAM, FPM, and EDO. SDRAM was an improvement because it synchronized data transfer between the CPU and memory. SDRAM allowed the CPU to process data while another process is being queued. 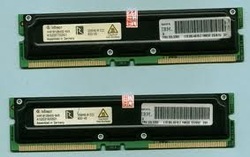 SIMM is a memory module with 72 or 30. SIMM are considered legacy components and can be found in older machines. 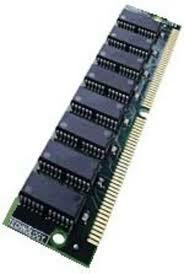 DIMM is a memory module with 168 pins. 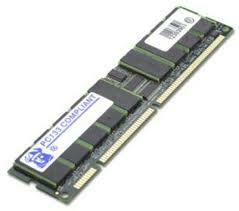 DIMMs are widely used today and support 64-bit transfer. Many cabling issues can be obvious to determine because they are usually due to faulty physical connections. Reconnecting cables can resolve many of these problems. Another common cable issue is mismatched interfaces. Always verify that the proper cable is being used with the proper interface. The best way to verify that the proper cabling is being used is to check the writing on the cable. Port problems are typically diagnosed with a slow performing or inoperative peripheral device. Troubleshooting the video display should start outside the computer case. Begin by verifying that the monitor is turned-on and plugged into a functional wall outlet or socket. Test the wall socket by plugging in a known good device. 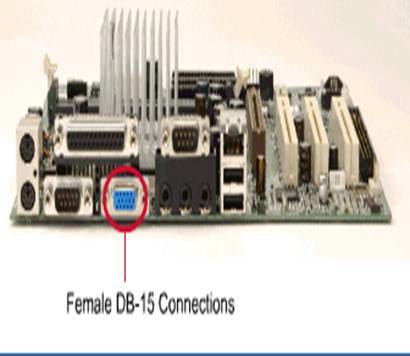 The female DB-15 located on the back of computer case is the most common monitor connection. Some computers will be configured with two different hard drives. If two hard drives are configured on the same ribbon cable, they must have a master slave relationship. Cable Select (CSEL) is an option that decides master/slave hard drive relationships based on the position of the drive on the IDE cable. Legacy sound cards had well documented interrupt conflicts with other devices, typically peripheral devices. Hardware errors can be caused by a physically damaged sound card and improperly set jumpers. Today, most sound cards are plug-and-play (PnP). Check the Control Panel Device Manager to see that the correct audio driver is installed, and that the settings match those recommended by the sound card manufacturer. If the drivers are missing or wrong then they must be added to the system through the Control Panel Add/Remove Hardware wizard. 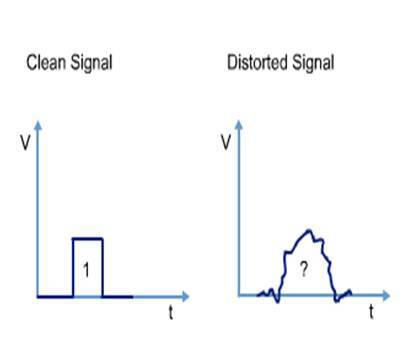 The power supply converts the current coming from the wall jack from alternating current (AC) into direct current (DC). An on board fan attached to most power supplies cools the power supply and internal components. Computer components are susceptible to heat. The components operate at high speeds and in tight spaces. The computer case plays an important role in cooling the internal components and is designed with cooling features. Computer cases have air intake vents, which are usually cut into the sides or front of the cases.